Owl synchronicities are quite common within the UFO/ET experiencer population. Owls have also shown up in reverse speech analysis years ago, by a former colleague and experiencer named Pat Mason back in 1998. I also interviewed Reverse Speech Expert David Oates in 1998 for a British magazine called Alien Encounters Magazine. The article is entitled, “The Resurrection of Truth: Reverse Speech Analysis–The Ultimate Truth Detector. This article was published in 1998, issue #25. The article is no longer available online through my web site, so I wanted to quote some pertinent excerpts from this interview as it relates to owl synchronicities, archetypes and metaphors of the subconscious mind. In my own estimation, our souls and what is within our own subconscious minds are always communicating to one another, whether we are conscious of this or not. And we do know that soul communication, dream imagery or reverse speech will often communicate in archetypes and metaphors. David Oates had his own UFO sighting in Bonsall, CA around that same time period and did a reversal of speech analysis about his own experience. I also asked him many pertinent questions about reverse speech which I believe are very important in understanding how and why archetypes show up within reverse speech and what this means. Oates told me, “I’ve done reversals on a woman who was molested as a child, yet had no conscious memory of the events. In her reversals she made graphic descriptions of the perpetrator. I’ve had people reveal names of relatives, bank accounts, hidden-agendas and behaviors that were later confirmed by the individual. But I have had people who come to me claiming to have had a particular experience and they didn’t. In the reversals all you get is a jumble of metaphors, which tells me they are not telling a true story, even if they believe it to be true. It is an unconscious manifestation of some deep internal conflict. If something is true, the reversal will give accurate direct information confirming it. If it’s a lie, the reverse speech will flat out say it’s a lie, or give motives why the person is lying. Reversal: It was so big. Reversal: They pull you with Samson’s soul. Have to recognize that it was so big. Oates goes on, “If the wolf and goddess work together they will have a behavior of love and compassion. If wolf and Satan work together then aggression and anger is the generated behavioral pattern. Operational metaphors describe how behavior plays itself out according to the way the structural metaphors interact. There are great similarities between reverse speech and Jungian archetypes. Some metaphors are unique to the individual much like in dream symbology. In reverse speech we have a reference point of the forward speech to confirm much of the meaning. I see the same metaphors over and over again in the same context for many other people. The structural metaphors always communicate truth with a capital T. Operational metaphors are different. Even if a person believes they are lying, the structural metaphor will not support that lie. An incongruity will represent that. If this is true, then there can be a therapeutic value to understand and even consciously change our own “metaphors and archetypes”. http://hiddenexperience.blogspot.com/2013/08/i-finally-pulled-owl-card.html Mike Clelland also wrote an excellent essay entitled, “Synchronicity and the UFO Abductee” in the book “The Synch Book 2“(Sync Book Press, 2012). Reversal: God throw off to move in with the mystery of mysteries. Teach babies to set that up. Here the abductee is describing how within the alien abduction phenomena there is a truth detracting element to keep people distracted and away from the truth. We can see the archetype of the wolf emerging as the woman’s hunter and protector. Reversal: My fair wolf speaking up. He passed his truth to the girl. Here, is a reversal which pertains to spiritual mysteries as David Oates has also found. Reversal: They amend these dreams…if they make “em, I’m learning. Reversal: In the darkness…we seem to help the aliens. Reversal: Care. The owls knew it was their memory ship. Reversal: Ride on the grey. Reversal: Why in the grey deep seed. They pierced us, they pierced us, hey. In two reversals the word “grey” is found, which in my opinion, refers to the Grey aliens, and how they embedded or pierced us somehow. I recall in Peggy Kane’s reverse speech work, she had the repeated metaphor of “net” show up in conjunction with aliens, dark entities or forces. As if some kind of “net” is imposed over the person to keep them entrapped under some form of control or deception. In more of Pat Mason’s work she found references to the owl archetype several times with an abductee in conversation. In an online article entitled, “Encounters with the Unknown: Hidden Messages” Pat Mason discovered many reversals that were quite revealing. Reversal: I got worth. Then who are they? Reversal: The owl lead her. Reversal: He who pushed it. Reversal: See owl. Wishes you could see it. Send me back a net. Reversal: No mere image, is it? Reversal: The owl called within it. Still talking about her therapist, she was trying to get him to help her get information from the researcher who was analyzing a sample of the fluorescence. Reversal: Sham. Come right out with it. In Native American medicine, the animal powers, spirits and allies can manifest in ones experience through various means. They can repeatedly appear in physical life in association with certain patterns, in dreams, synchronicities, as power animal retrievals, or in medicine card displays. Animal medicine, according to authors Jamie Sams and David Carson, (Medicine Cards, St Martins Press, 1999) is anything that can improve one’s connection to the Great Mystery and to all of life. This includes healing of mind, body and of spirit. This medicine is also anything that brings personal power, strength and understanding.(pg. 13) Animals in nature can relay messages to us through their habit patterns or essence of being, oftentimes in the dream world or Nagual, but they can appear in other ways in physical life (the tonal) or within appearances through synchronistic experiences. Lessons can be learned from many animal powers and one can call upon the power of a particular animal to gain understanding and wisdom in the great mystery of life. Depending on the context in which the animal appears and ones own personal lesson and internal archetypal symbology, determines what meaning it may have for you. In my personal experience with a power animal retrieval by an authentic shaman, the animal communicated to me a unique medicine that revealed itself in its own way. In other words, there may be general meanings you can read or find in books such as the Animal Medicine cards, but real life experience with an authentic power animal is really what one should go by in terms of its medicine for you and your own unique journey with this animal spirit ally. In other cultures like ancient Greece, the Goddess Athena was associated with an Owl on her shoulder. 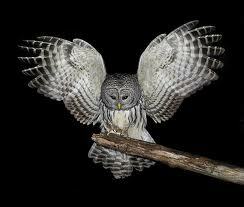 Owl teaches unseen truths and can enable one to perceive the whole truth. Basically people with Owl medicine can see through people and their ulterior motives and not be deceived as easily as others. Conversely, if Owl shows up in a contrary position in the medicine card spread, or under unique adverse circumstances, its appearance can also mean you have been greatly deceived by either yourself or another. Perhaps witchcraft or black magic is being used against you. It can be saying to you to look deeper into yourself about what you are “in the dark about” or even to look at your own darkness, shadow and blind spots. I’ve found that doing research into others’, personal experiences with animal powers is more accurate than a few books on animal totems or medicine cards. Biographies of shamans, saints, witches, yogis and even your own personal experiences will teach you how these power animals and medicine apply to you or a particular situation. I believe that we can have our own unique dream symbology as well as sharing a collective, archetypal internal imagery. This is represented in dreams, shamanic vision quests, or even through reverse speech, as well as personal synchronicities. 6/18/013 Superwoo Radio Interview with George and Cynthia Kavassillas, Kelly Ka Sha, and Perry Mills, in a Round Table Discussion on Chakras/Kundalini versus the pure Heart/ Soul connection for authentic being. This is a short interview that I did in January 2013, for a high school student studying in Mexico. I thought I would go ahead and post it here for those who may have similar questions on my research and how it relates to Ufology, Alien Abduction/Encounter phenomena and Spirituality. 1. Tell us a little bit about your background. I was born and raised in California and now reside in Western North Carolina. I have a B.S. degree in Biochemistry and also a Masters degree in Counseling Psychology. Certification in hypnotherapy, studies in Oriental Medicine, Shamanism, Tibetan Buddhism, and some Christianity including early Gnostic teachings from the Nag Hammadi Library. I am a practitioner of Astanga yoga and meditation. 2. How did you get interest in Ufology? I became interested in Ufology as a child, and my father had an interest in UFOs and aerial phenomena, as he was an aerospace engineer at Lockheed-Martin in Silicon Valley, CA for many years. We had occasional UFO sightings and paranormal experiences also growing up. 3. Which Ufologists have inspired you? Dr. Jacques Vallee, Barbara Bartholic, Bud Hopkins, Dr. Karla Turner, Derrel Sims, Dr. Roger Leir and Dr. Corrado Malanga of Italy. 4. What is the ‘Alien Love Bite’? This was a term created by early “alien abductee/experiencers” that described a particularly powerful love connection with another person, whereby the love connection was believed to be “engineered” by one of the person’s alien handlers. It had an alien signature to it. Oftentimes both individuals were “experiencer/abductee/contactees” where at least one of them recalls being pre bonded with their partner while on board an alien craft or within an abduction type of scenario, oftentimes remembered as vivid dreams. Sometimes the bonding took place as children and then the couple was taken and put together several times throughout their childhood or teen years or even adulthood, only to later meet in real life. Often in unlikely and opportunistic situations–that made one feel it was “staged” or divinely arranged. This set off a de ja vu and a powerful “high chemistry” soul bonded connection type of experience. This is described fully with many case histories in my first book called, “The Love Bite: Alien Interference in Human Love Relationships”. The syndrome of a “love bite” often begins with magical dream meetings, memories of seeing them in alien contrived settings, or perhaps in a variety of situations, where a romantic and powerful connection is felt. Then a love infatuation or obsession follows for one or both partners. Then the drama of high emotional ups and downs, sometimes paranormal activity and increased alien visitations occur during the love infatuation phase. Longing, passion, yearning, jealousy, rage, love, all the emotions wrapped into one wild, emotional roller coaster ride. More often than not, after a period of time, one person is “switched off” emotionally, oftentimes right after an alien abduction/visitation, and then they no longer have strong feelings for the other partner, who may then pine away in unrequited love. It is terribly painful emotionally. It has been postulated based on the number of “love bite connections” that didn’t work out right, that the aliens are “feeding off of the emotional energy”. And this being the reason for the wild emotional roller coaster ride and obsessive quality of the relationship. In my second book, The Dark Side of Cupid: Love Affairs, The Supernatural and Energy Vampirism, more case studies are examined from the perspective of relationship dynamics when energy vampirism is present. It is not firmly hypothesized in this book whether the “beings orchestrating and influencing the relationship” are ETs or not. Instead, we say it’s a “Cupid” and this Cupid can take many forms, anywhere from non descript “spirits”, demons, troll spirits, reptilians or ETs. It’s focus is on recognizing whether ones love connection may indeed be paranormally interfered with by these interdimensional kinds of beings who enjoy creating excessive drama and feeding off the energy. Hence there is alot of emotional and psychic vampirism occurring in one of these kinds of love relationships. It’s more pronounced in terms of psychic vampirism, where a “third party entity” is observed overshadowing one or both partners. Disruption of true love is also reported, by these same kinds of beings, much like in the movie “The Adjustment Bereau”. 5. What do you think about the nature of the ‘UFO phenomena’? It is physical and paranormal/non-physical at the same time. Our understanding of physics must be re-examined here because UFOs do not always appear physical and yet they can leave physical traces, respond and interact with our consciousness, implying that they are intelligently controlled and function as both physical and non physical objects. In general, like Jacques Vallee has said for many years, I believe for the most part, UFO’s are a deceptive control system over humanity. Although now there are many UFO types of advanced air and spacecraft engineered by our own military and aerospace companies. 6. How do you know that there are many races and not only one intelligence with different costumes? Many types of aliens, ETs and interdimensional beings have been reported. Many of the interdimensional ones have abilities to “shapeshift” and be chameleons of sorts. In one of Dr. Karla Turners books, Masquerade of Angels, the Ted Rice case suggests that many ETs were involved working together on the same UFO/craft or “other environment” in Ted’s case. This involved genetics and cloning, among other things–including a love relationship set up with a school mate at 14 years if age. A classic “love bite”. And, one has to remember, it was the late Barbara Bartholic who taught me all the intricacies of how aliens set up people in bonding dramas and engineer powerful love obsessions. No other abduction researcher was willing to admit to this, thinking that love relationships were not even related to what the aliens were doing to their “chosen ones”. It’s not just about medical exams, hybrid genetics and physical UFO space craft. The alien agenda is much more involved, it’s not just the physical “hybrid genetics” issue, but one of spirituality, the soul if you will. To make a long, complicated story short, the beings who abduct humans for the purpose of hybrid genetics and soul energy vampirism or entrapment are not in humanity’s best interest. Some believe they are all part of a team, wearing different masks but all working for the same kind of thing–human soul harvesting. Of course in Christian exorcism and possession studies, many demons have different masks but all work for the one deceptive “Satan/Lucifer” kind of entity. What one can say is that there are many spirits/demons that are a kind of emanation of the same larger being such as Satan or Lucifer. But even these names and notations may not be accurate. 7. Have you ever received any threat by some Secret Society? Yes, but mostly covertly, or through a person sent to me as some kind of spy or “agent under control”, psychic attacks, etc. 8. Have you ever seen any sign of ‘alien attack’ because of your work, as you describe in your books (headaches while trying to find the truth)? Yes, countless times. It’s mostly observed as distractions, disruptions, sudden illnesses, computer and electrical malfunctions, people suddenly “turning on you” for no apparent reason, or mysterious characters entering your life to affect you in some way. And of course the paranormal anomalies and outright demonic attacks and spiritual warfare. Health issues and sudden poisenings, etc. Of course after experiencing this enough times, I figured alot of this is demonic. In other words, black magic and forms of mind control and remote influencing technologies are part of this. So, it certainly caused me to re-examine many Biblical truths and warnings about “the Accuser, Satan, Lucifer, Soul harvesting, etc. And Jesus Christ of course, what he came to tell us and to do to become free. I think he knew the game plan on planet Earth and wanted to educate us to help set us free. Unfortunately the deception runs into every religion on planet Earth as well. No one religion is free from some sort of corruption by “the dark side”. And there are truths in all religions and some falsehoods too. So it’s good to be able to view truth through archetypes, forces and myths. Expanding awareness, and understanding who we are as humans, helps us understand who the aliens, ETs are. 9. In your work, you’ve talked a lot about the ‘spiritual warfare’ in the UFO phenomena. What do you think of the spiritual side of the phenomena? Do you think that, as many have suggested (especially in Spain, with our great Salvador Freixedo), aliens may be behind some mediums, apparitions, etc…? Yes, I agree that many aliens are masquerading around as angels and spirit guides and many things. I answered alot of this question above. One has to understand too, from a larger perspective, there are other powerful beings higher up on the levels of creation above these aliens taking on various forms/masks. Let me give you an example. For some “experiencers”, once they have gotten free from alien abductions, alter their view of it, and seek the truth of their own being, spirituality, etc., is when other beings start interacting with them, either to teach, mislead or distract them. Beings such as the Primordial man can take on any figure one worships or believes in. In a very powerful way. It is like a lesson or maze to get through all the illusion. Who knows what this will ultimately lead to. But understanding our own self, our spirituality and divine soul nature is part of the key. This is an inspiring interview with Mooji on the understanding and beingness of the I AM prsence. Forgiveness is a natural arising of this truth. Aspiration for truth and freedom allows grace to move through you and your life. This is a good contemplation for those who are caught up in the belief that “the whole world is awakening”. Malevolent Alien Abduction Research – Colleen Johnston on alien manipulation and UFO Cults.